Patrick Ward, a junior at Thomas Jefferson High School, listens to Christine Bacola talk about accumulating interest on credit card statements in a financial literacy class at Thomas Jefferson High School. With so many required classes to take, many students at Thomas Jefferson High School don't have time for the elective course on personal finance offered to juniors and seniors. Before long, some of them might wish they had learned a few things about credit cards and checking accounts before they find out the hard way. "I know when they go to college they'll be inundated with credit card offers and they'll have student loans to deal with," said Christine Bacola, who teaches the class. "They'll have jobs and taxes. They'll be renting apartments and they'll be out on their own." Students are often leaving high school with advanced knowledge in English, math and science but very little understanding of basic financial principles. On a recent survey of high school seniors by a financial literacy coalition, the average student missed half of the answers to basic questions about credit, budgeting, interest, investing and planning for retirement. Thomas Jefferson High School, in the West Jefferson Hills School District, is among a small but growing number of schools in Allegheny County that have either incorporated courses on financial literacy into the curriculum or at least offer special programs on personal finance. "I've learned how much consumers in this nation are in debt," said Patrick Ward, 17, at junior at Thomas Jefferson. "People I know who aren't taking this class are clueless. They'll get out of school, start working and wonder where their money went." On a recent day, Mr. Ward and his classmates learned how to calculate the average daily balances on old credit card purchases and figure out finance charges. "You definitely want to lower your balance if you make a payment," Ms. Bacola told the class. While most teachers and school administrators agree that financial education is an important subject, the hard part is getting educators to fit financial literacy into the school day. School budgets across the country are already tight, and there are competing priorities for what schools need to teach in light of federal and state standardized testing requirements, including the federal No Child Left Behind Act. "Because of No Child Left Behind, schools don't get rewarded for improving the financial literacy of students," said Robert Manning, author of "Credit Card Nation" and a professor at the Rochester Institute of Technology. "If it's taught at all, it ends up being folded into another subject and becomes less of a priority. Financial literacy in public schools is far more a desire than a realistic initiative." Brittany Bloskis, a senior at Thomas Jefferson High School, takes notes as she listens to Christine Bacola. While personal finance could be covered in any number of high school and middle school classes, such as consumer science, economics, math or business, it does not yet have a home in school curriculums because no one is really sure who should be teaching it. "When we go to schools to try to promote financial education programs, one of our challenges is finding who to talk to," said Carrie Coghill Kuntz, president of D.B. Root & Co. in Pittsburgh and a former board member of Economics Pennsylvania, an organization that hosts financial literacy programs in schools. Pittsburgh Public Schools do not offer personal finance as a course of study in its regular curriculum, said Ebony Pugh, communications officer, but city students involved in the career and technical education program have financial training incorporated into their classes. Pittsburgh students also have the option of signing up for a family consumer science class, which covers budgeting, balancing checkbooks and other aspects of running a household. In addition, special presentations are occasionally brought to city schools. Pittsburgh Steelers tight end Heath Miller teamed up with VISA USA in October to introduce city students to "Financial Football," an interactive money management computer game. Another obstacle to offering personal finance to K-12 students is convincing teachers they can and should teach the course, even if they have made mistakes in their own finances. Some teachers, ashamed of their own overdraft charges, will shun the subject because they may not feel prepared or qualified. Close to 100 Pennsylvania teachers were trained last year to teach personal finance through the Governor's Institute for Personal Finance and Entrepreneurship Education. Teachers from all grade levels and subject areas spent a week on the Lehigh University campus learning how to include advice about money in their lessons. Economic Pennsylvania is best known for hosting its popular Stock Market Game in public and private schools across the state, but the organization also works directly with teachers. "One of the beauties of Economic Pennsylvania is we have programs that teach teachers," said Sam Zacharias, vice-chairman of Economic Pennsylvania's board of directors. Clairton City School Superintendent Robert David was so impressed with the program and its goals, he joined the advisory board of Economic Pennsylvania. "There are so many things we're required to do by law in the curriculum on a daily basis that there's often not enough time for personal finance," Dr. David said. "We've made it a priority. There's a purpose to it. Kids really enjoy it, and they're learning something valuable. "They need to understand money can work for them and know the value of money. In many homes, kids don't get that basic understanding." The U.S. House and Senate have passed resolutions declaring April to be Financial Literacy Month, and a number of states, including Pennsylvania, have taken similar actions. But so far, no state has made personal finance courses mandatory. "We'd rather see them pass laws that require financial education. But resolutions are a good start. It's an indication that state governments are looking at the issue," said Laura Levine, executive director of Jumpstart Coalition for Financial Literacy in Washington, D.C.
Jumpstart Coalition sponsors a national survey every two years that measures the financial knowledge of high school seniors. Those surveys, the most recent last year, indicate seniors are woefully unaware of money matters. "We test only 12th grade students," Ms. Levine said. "That's our snapshot of youth just as they are about to go out into the world, just before they get credit card offers and investment solicitations." The hazards they face show in the growing personal debt in this country. For the first time since the Great Depression, Americans are spending more than they earn, drawing on savings and building up debt to do so, according to last year's federal figures. Personal debt levels remain at an unprecedented high; so, too are bankruptcy rates. There were 1.1 million bankruptcy filings in 2006, suggesting that a significant number of households are in serious financial trouble, according to federal statistics. As fewer companies offer pensions and Social Security benefits become more endangered, the burden of paying for retirement is going to be shifted to the next generation of workers. Students should be as financially literate as they are liable, financial planners say. "As the new generation approaches retirement age and find they can't, then financial literacy will become an issue," said Ms. Kuntz. "The unfortunate thing is the attention it will be given will come out of the pain people feel because they can't retire." Fritz Heinemann, director of Economic Pennsylvania, said after working two decades in the financial planning industry, he has seen people 50 years old who thought they could retire at 60 but will have to work until age 75. "What happens when we have people 75 and 80 and they can't retire?" he said. "It would be great if financial education was required by the school system. "Where kids get it now is all voluntary. It's either through special programs offered at school or at home. Adults are just as confused as kids. They're still trying to figure how to do it themselves, and it really does leave a gap." 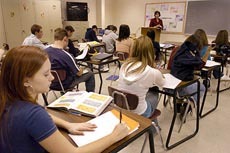 Other school districts in Allegheny County that offer personal finance electives at the high school level include Gateway, Quaker Valley and Pine-Richland, which offers an extensive unit on the stock market and an Internet stock market game. Sue McCauley, a social studies teacher at Quaker Valley High School, has been teaching personal finance as part of the course there for 16 years. "We talk about setting financial goals, the importance of an emergency fund and taking advantage of compound interest for retirement," she said. "There's a whole unit on credit and how to establish good credit. "I think it's the unit kids are most interested in because they can relate to it and can see the relevancy of these skills." This story ran on Pittsburgh Post-Gazette on January 7, 2007.